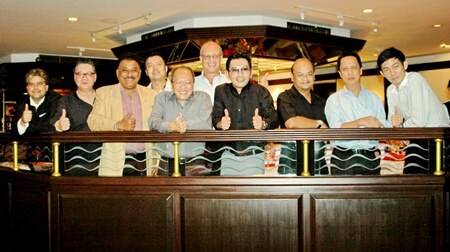 After a break of many months the GM Gang came together once again for a dinner meeting at the Montien Hotel, Pattaya, on Tuesday, September 24. Hosted by Prayuth Thamdhum, the effervescent general manager of the ‘Royal Residence’ – the ancient interpretation of the name of the hotel – guests were treated to an evening of conviviality and a fusion of Asian delights aptly named ‘Pattaya Variety’. In an exclusive interview with Pattaya Mail, Prayuth spoke of his background and the beginnings of his career as a hotelier and how he came to take up his responsibilities as GM of Montien Pattaya seven years ago. Chatchawal Supachayanont speaks to his friends. Prayuth was born in Lopburi, the son of an Air Force General, and it might have been expected that their son would continue in the military mold or tradition, but that was not Prayuth in any way. He was sent to further his education in Bangkok, and he believes the seeds of independent thought were already sown by then. He walked past a hotel and peeked inside. “It looked so smart. It had a beautiful ambience,” said Prayuth. He knew then where he was headed. 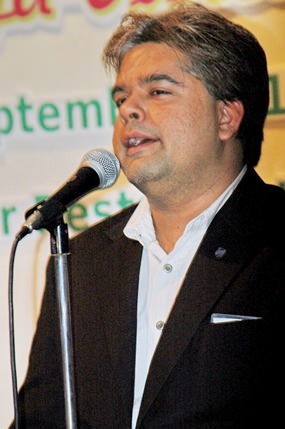 Tony Malhotra vowed the guests with his emotional rendition of love songs. Having made the decision, he joined the hospitality industry where we all began our careers, at the bottom. It is at this time that young people can doubt their choice and leave, but not Prayuth. He knew this was the right choice for him. Prayuth, despite his youthful looks, has been in the industry for almost 30 years, after starting his career in the Montien in Bangkok. Prayuth went on to extoll the finer qualities of the Montien saying, “This hotel is well organized and has grown to become a very popular place, especially for families. A large number of the guests are regular visitors who often return to the hotel and have done so for a number of years. Jorge Carlos Smith (left) is greeted by Prayuth Thamdhum on his arrival. 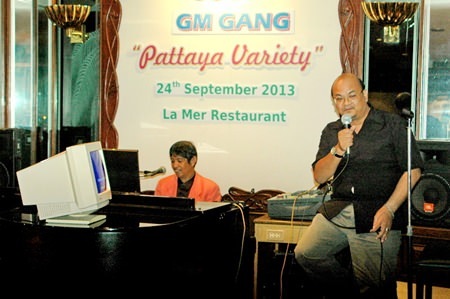 In his speech to the gathering, Chatchawal Supachayanont, general manager of Dusit Thani Pattaya and symbolic head of the GM Gang said, “It’s so wonderful that the GMs have been able to meet for so many years. 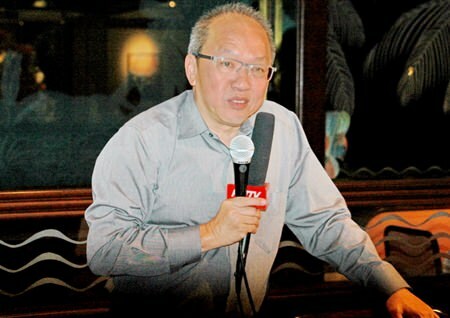 “I believe that Pattaya is booming and many new hotels will open soon along with many upmarket condominiums. This is good as it will attract more people to the city with a higher spending power. I believe that the tourist industry in Thailand can do much better than that in the neighboring countries which will lead to a greater interest in Pattaya. At present the majority of the foreign tourists appear to be from China and Russia and a huge number from India and other countries in Europe. Guests were amazed at Chonlatee Nakamadee’s singing talents. He thanked all the staff of the Montien Hotel for the excellent service they provided during the course of the evening and announced that the host venue for the next GM Gang dinner would be at the Long Beach Hotel. The balcony scene (L to R) Tony Malhotra (Pattaya Mail), Jorge Carlos Smith (GM Hard Rock Hotel), Peter Malhotra (Pattaya Mail), Nopporn Kanchanamanee (District Sales Manager of Thai Airways, Pattaya), Chatchawal Supachayanont (GM Dusit Thani Pattaya), Philippe Delaloye, Prayuth Thamdhum (GM Montien Pattaya), Chonlatee Nakamadee, (GM dusitD2 Baraquda Pattaya), Neoh Kean Boon (RM Dusit Thani Pattaya), Sanpech Supabowornsthian (GM Long Beach Garden Hotel & Spa Pattaya).